I was recently at Macmillain Publisher's children's Fall 2012 preview event and their books are AWESOME!!!! (A sneak peak will follow in a future post.) What struck me, however, was the buzz all the editors used... Visual Literacy. - read faces/body language when interacting with others (or watching movies, videos, TV). Part 1: "Visual vs. Verbal Literacy" relates how BOTH visual and verbal literacies are vital for learning and cognition; suggested readings for kids of all ages are included. Part 2: "Visual / Verbal Literacy: Reluctant Readers and Brick Walls" relates how visual literacy and visual texts can help reluctant readers find happiness in reading books. In this post - Part 3, I focus on visual literacy as an aid to critical thinking (understanding and recognizing relationships, developing creativity, and reasoning) and attention. I. HOW VISUALLY LITERATE ARE YOU? How does this tribe survive and care for its members? What is it's main form of sustenance? How might you describe this tribe's culture? Would you want to live in this tribe? Why / why not? Did you notice the rubber ducky? What purpose might it play in this tribe's culture? Did you notice the "One Way" sign? What purpose might it play? Does my pointing it out the rubber ducky and one-way sign change or influence any of your other responses? How does the image affect the viewer? How is the image composed? How do the symbols that appear in the image affect the meaning? How does the subject matter affect the viewer's responses? How do the materials used affect the meaning of the image (photo, drawing, computer generated images, animation...)? How does the cultural context affect the production and understanding of the image? Note: I will post the answers on Thursday, June 14th. If you want, feel free to leave your answers in the comments section. Visual literacy aids critical thinking because when reading a face or a picture, one must construct their understanding. There are no words to tell 'readers' what to think, there is an image relaying 'bits' and hints of information - as evidenced above. It is this CONSTRUCTION that we use when reasoning, comparing, contrasting and creating. Visual literacy aids boosts attention and attention skills because by definition, one must stop, look, attend to the art, and then proceed to make sense out of all its components. "Our language development does not define the limits of our cognition." Conversely, "our cognition is not defined by the limits of our language development." Each of these questions should be incorporated into discussions in your classrooms and homes to better understand the full message images relay in books, advertisements, etc. the details of faces, places,and objects added in the picture. .. ...THEY ALL were used by us to construct some level of understanding - they are the basics of visual literacy. Aside from the importance of images to help aid in critical thinking and attention, we live in an age where visual icons and illustrations are an integral part of our daily lives - from deciphering icons on our phones and computers, to building furniture bought for our homes, or using/viewing clips from pinterest or YouTube...(you get the message). Images and communication via images are EVERYWHERE! Here is a link to view more images from Tribes: The Dog Years - use my image above or more images here and answer the questions above with your family. Have an origami day - construct origami figures by following graphic instructions. Talk about messages that colors, fonts and images relay - play around with them and make non-verbal messages for each other. Try leaving daily messages for family members using icons instead of words. How well does that work? Make maps - treasure maps for dessert, or for a gift, or map out vacation plans. Have a crafts day, where everyone 'writes' up craft directions for a project to be completed by another family member BUT... the directions are all given through charts, icons and/or illustrations. How did the crafts projects come out? Keep a visual diary of vacations, of camp, of a fun family activity - using photos and illustrations. Compare this to written entries. How does it compare? Read graphic novels aloud - talk about the information the pictures relay and how the images ADD to the story line. Watch Disney's Carl and Ellie's story in Up (I've attached it below) or the first half of WALLE with a critical eye. Talk about how these movies told their stories visually - with limited or no words. How were the emotions and thoughts of those characters relayed? For more details of using visual cues to read faces go to "Facial Literacy or Securing Social Skills"
For more details on how to encourage inferencing skills, go to "What's all this about Inference?" 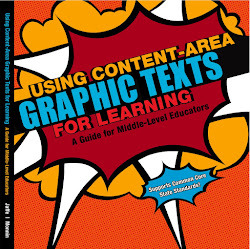 For more details on suggested graphic novels go to The Very Best of 2011 Kids' Graphic Novels. Thanks for the visit. Please leave your reactions and/or quiz answers in the comments and please make sure you check back on Thursday, June 14th for the answers. In the meantime, have a great week. 1. This takes place on earth in what looks like the plains area of the United States. 3. The tribe survives by hunting and gathering - you can see the laden sleds entering the village - this is seen relatively clearly in the inserted box at the top right corner. 4. This is a social tribe - you see that by its configuration - semicircular, inclusive; we see this by the way the background characters are interacting in the bottom panel. They appear strong, concerned, not hostile. The rubber ducky is in the bottom right corner, hanging from the (Shaman's) stick. The one-way sign is on the center character's shirt. 1. Personal... I find it the image engaging and inviting - what about you? 2. I love the horizontal panels with the inserted boxes. I find the boxes really bring in and engage the reader. What about you? 3. I think these symbols give A LOT of information. They tell you these are 'modern' or even post-modern times and that these tribes have 'collected' and used abandoned resources. Thanks for playing - I hope you enjoyed the challenge! I have a tendency toward skimming text, and, well, everything.....Fascinating stuff - tells me to slow the heck down and pay attention to details. I am bookmarking this post- it is great and I want to share it with parents in my classroom that want to know how to support their child's learning over the summer-and I am not a big fan of giving kids worksheets for the summer. Thanks for all the information!!! The first 10 minutes of UP made me cry. I think I liked the rest of the movie LESS for that, because the big emotion came too early. Whew, I have barely had my morning cup of coffee and my brain isn't fully in gear. I must come back and really read and think about this one. I find it fascinating. Thanks for sharing the information and challenging us today. I have to say Amen to Photowannbe....Wow, you really put your heart and soul into this one. Great article and a ton of critical thinking! Thanks for taking the time to share this most interesting post. I have read a couple of your posts, great stuff. I am going to bookmark your page so my husband can read it, he is a special education teacher. I am also following you, and found you via 'flock together blog hop'. If you have a chance stop by and visit me at http://thebargaingame.blogspot.com/. Between being on summer vacation and just getting through surgery, I plead lazy. I love the idea of making crafts and making treasure maps to build visual literacy.How about puzzles? I just bought a puzzle to work on with my youngest, who is a reluctant reader. Wonderfully meaty post about visual literacy! Thanks for sharing this. I really put visual thinking & learning into any kind of perspective like this. I could not find a rubber ducky & 'think' I found the sign. the faces are full of emotion , sadness & pain is what I interpret. taught me another lesson. whether I understand it all...? thanks! I like to think I am a visual learner just as much as I can learn with imagination - only say that because I know people who can only understand if they see and has no imagination at all! What a beautiful movie! No words were needed and that is great. I was really touched by the happy couple, growing old together. I love that kitty photo. Wow there is a whole lot going on in the page you have chosen, I'm going into information overload. As you helpfully pointed out the rubber ducky and one way (which I would have completely missed, I should look at the edges). Objects taking on a different meanings from a forgotten past. My eight year-old once said to his grandma, "Grandma don't die when I go back to Thailand. I don't want to see you in a coffin. I will cry." The last part of the Up video shows dying / parting (I find it very sad or maybe I'm just a sucker for sorrow sometimes). It could trigger sad thoughts in my son when he sees it (he hasn't seen the movie). How do I explain death and dying to him besides saying the obvious that it is a normal part of life? I mean how to minimize heartbreak, sadness or fear? Thanks. Thank you so much for your comment/question, Hazel. This is such an important question and I am not sure there is one answer that fits for everyone. For some, this movie may not be appropriate. For some I might say to follow your own 'gut' and instincts in terms of how to talk to your child about death. I think you are right to say that it is a normal - albeit very sad - part of life. I would recommend that whatever you say, LISTEN to what your child is (or is not) saying, and observe how they are interacting. Take cues from them - they will help you explain it. Good luck! This is awesome and very interesting Meryl. I have saved up this video to share it with my hobby, he would love it. Thanks for stopping by. What an awesome post! I learned something!! So glad I came by from the Wordless Wednesday a day late!